As a main text, a supplement to writing and grammar classes, or as a reference guide, Eye on Editing provides explanations and practice for the most frequent errors in intermediate and high-intermediate student writing. The Eye on Editing series is designed for writers who have achieved a certain fluency in English, yet are often unable to identify and correct common grammatical inaccuracies in their work. Students develop solid editing skills as they work through a diagnostic pretest, grammar explanations with easy-to-read charts, a progression of increasingly challenging editing exercises, and guided writing tasks on topics of current interest. The final chapter¿s editing exercises require students to integrate all the skills they have learned. 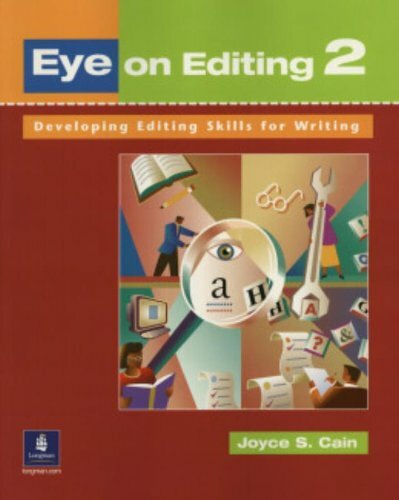 The Eye on Editing series includes Eye on Editing 1 for intermediate students and Eye on Editing 2 for high-intermediate students. Click here to read a review of this book. The review was written by Julie Vorhort-Alcorn of Portland State University (OR).